Sharks keep our oceans in balance but are slowly declining. The following website has Lessons and Films. As a result of a United Nations General Assembly resolution passed in December 2008, World Oceans Day is now officially recognized by the United Nations as June 8th each year and is celebrated around the world. Around the World: People around the world help to protect our future by learning the importance of the oceans we share and take action by doing beach cleanups, educational programs, art contests, film festivals, sustainable seafood events, conserve water everyday and recognize how important our marine life and oceans are to everyone. What country had the idea to celebrate World Oceans Day? What date is World Oceans Day? Who is responsible for our Oceans? Should we care for our oceans everyday? We have lots of water in streams, rivers, lakes and our oceans. We cannot make new water. We must take care of the water we have. When it rains, water fills our streams, ponds, rivers, lakes and oceans. Then water evaporates and forms clouds, so it can rain again. It is very important for all of us to keep all of our water clean. Can we make more water ? What happens to rain water? 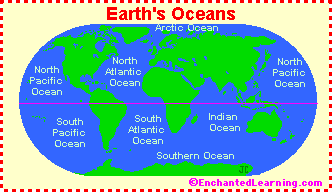 We have 5 oceans and many seas around our world. Oceans and Seas are salt water. Our streams, ponds, rivers and lakes are fresh water. Streams, ponds, rivers and lakes make up 3% of all the water in our world. Oceans and Seas make up 97% of all the water in our world. 80% of the oxygen we breath comes from our oceans and seas. Keeping all of our water clean is very important for plants, animals, fish and people. How many oceans do we have? Where does most of the oxygen we breath come from? Why Should We Conserve Water at Home? ¨We cannot make new water. ¨We must save as much of the water we have. How can we save water ? Our oceans are beautiful. 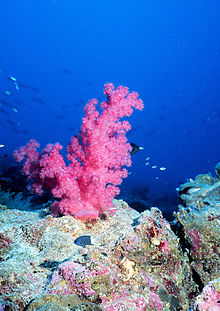 Many plants and fish live in our oceans. All the plants and fish depend on us to help them. To help them we must help keep our waters clean. 1.We can save water and not waste our water. 2.We can help keep our water clean in our streams, ponds, rivers, lakes and oceans. 3.Recycle plastic, cans and paper. 4.Keep plastic out of our streams, ponds, rivers, lakes and oceans. Plastic does not disappear like a piece of paper does after awhile. Plastic hurts our fish. Each of us makes a footprint on our world. It is up to us to make sure our footprint is small which is good. If we damage plants or animals we are making a bad footprint. If we help plants and animals our footprint is good. If we damage (pollute) our water we are making a bad footprint. If we help keep our water clean our footprint is good. If we waste water we are making a bad footprint. If we help save (conserve) water our footprint is good. If we make a good footprint we are making a good (positive) difference and can become an OCEAN HERO. Dora and Dennis are Dolphins. They live in the Pacific Ocean. Dennis is one year old. Dora is his Mother. Dora is very big, as big as 4 adults together. Dora takes care of Dennis and watches over Dennis all the time. Dennis is growing. He is already the size of one human adult. Dennis learned to swim as soon as he was born. Dora and Dennis live in a small village, called a pod, with 60 other dolphins who are their family and friends. They swim together and have fun together. Dennis has friends named Nancy and Todd who are two years old. Nancy and Todd like to show off.They can do jumps and flips in the water. Dennis watches them carefully. It looks like so much fun. Dennis dreams of doing jumps and flips just like Nancy and Todd. “Dennis come and we will eat lunch” called Dora, his Mother. “Can’t I watch Nancy and Todd some more, please, please?” asked Dennis. “I want to learn to do jumps and flips just like them” said Dennis as he dreamed he could do it. “When you grow big and strong like Nancy and Todd you will be able to do jumps and flips just like them. For now, you must eat lunch so you can grow big and strong” said his Mom, kindly and with love. 1.Where do Dora and Dennis live? 2.Can you find the Pacific Ocean on our map? 6.What are the names of Dennis’s friends? 7.What is Dennis dreaming of doing? 8.What did Dennis’s Mom tell Dennis he must do before he can do jumps and flips? Each of us can become an OCEAN HERO. We have to promise to help keep our rivers and lakes and oceans clean. Would you like to be an OCEAN HERO? Each of us can become an OCEAN HERO. We have to promise to help keep our rivers and lakes and oceans clean and save water. Would you like to be an OCEAN HERO? Please visit www.WorldOceansDay.ca to learn how to become an OCEAN HERO. Dennis is one year old. Dora is his Mother. They live with their family and friends in a group, called a pod. Dora and Dennis can talk to each other in many ways. 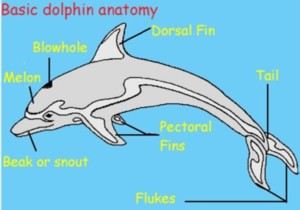 They can make squeaks and whistles from their blowhole at the top of their body. Dora and Dennis also talk with their body, moving their body a special way to send a message. Dolphins can learn words people speak to them. Dolphins can mimic people. People have not learned to listen to Dolphins yet. People are trying to learn to listen to Dolphins. Many scientists believe Dolphins are as smart as people. 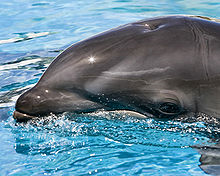 Dolphins hear by using their small ear openings on each side of their head. Dolphins can hear more sounds than people can. Dolphins can hear seven times more sounds than people can hear. Dolphins hear the sounds of other marine animals. Dolphins also use sonar to see where other marine animals are. Sonar is sending sounds out and feeling the reply. We think Dolphins send sound clicks using their forehead and feel the reply in their mouth. 4.How does Dennis talk to his Mom? 5.How does his Mom hear him? All marine animals living in our oceans play games. 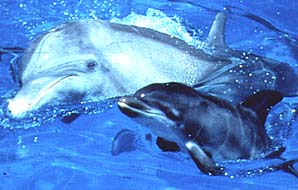 Dennis is learning to play games with his Mother and the other Dolphins who know over 300 different games. Dennis likes to play catch. His Mother, Dora, holds a piece of seaweed in her mouth and passes it to Dennis very carefully so he can catch it. Dennis passes the seaweed to their friend Todd. Then Todd passed the seaweed to Nancy who catches it and passes it back to Dora. Dennis is excited. It is his turn again. Dennis wants to catch the seaweed on his first try this time. Dennis is very happy. He did it. He caught the seaweed on his first try this time. The next game is Dennis’ favourite game. All four dolphins will swim upside down and blow bubbles. Then they will turn over and chase the bubbles, trying to catch each bubble before the bubble reaches the top of the water. The winner will be the dolphin who catches all of their own bubbles. “Yes Mom, I am ready” Dennis told her, very excited. “Get ready, get set, GO” called out Todd. Dennis swam upside down, blew bubbles, then turned over to swim fast and catch the bubbles. He won!Dennis caught all his bubbles before the bubbles reached the surface of the water and before the others caught their bubbles.Dennis is very happy! 1.What games did Dennis play? 2.What else could the Dolphins use to play catch with? 3.Which game is Dennis’ favourite game? 4.What other games do you think Dennis could play? 6.Could the plastic bag hurt the Dolphins? Dennis is one year old. Dora is his Mother. They live with their family and friends in a group, called a pod. They play together and watch out for each other. Dennis and his friends were having fun playing catch. Dennis is the youngest so the others pass to him very carefully. They found a plastic bag to play with. “Do not play with that plastic bag Dennis” said his Mother, Dora. “Plastic bags are dangerous. You could choke on it” she told Dennis and his friends. “But it is fun Mom, it floats and fills with water and the water flows out of it when we go to the shore. Please can I just play with it for a little while?” pleaded Dennis. “No Son, it is too dangerous. I will put it on a rock at the shore. Plastic bags are too dangerous. People sometimes forget and leave plastic bags, plastic rings and other plastic things near the water. The wind and the waves bring this garbage out to the ocean where it is a danger for all of us living in the ocean” said his Mother sternly. “There are other things which end up in the ocean because people are not careful” Dennis’ Mother told him. “Ropes, wire, fishing line, fish traps and cans are other things we must be careful of because they will hurt us. And bigger things like tires, old boats, motors, bicycles, wood boxes with nails, pails, and fishing rods. 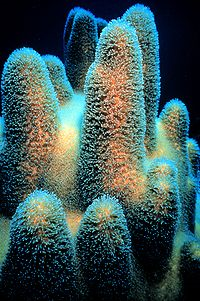 If it does not grow or live here in the ocean, you cannot play with it or swim near it. Do you understand Dennis?” asked his Mother. “Yes Mother, I promise I will only play with sea weed and leaves and other things which grow and live in the ocean” said Dennis sadly as the remembered all the garbage they saw one day they were playing near the shore. “Soon, when you get a bit bigger, we will travel to an area where all the plastic has gathered. It is like a huge bowl of soup. The plastic never goes away, it just breaks into small pieces. Some call it the great pacific garbage patch. Your aunt saw one in the Atlantic Ocean too” Dora said. “Why do people do that? Don’t they like us?” asked Dennis. “People like us Dennis, they really do….. but they do not think about the harm their garbage is for us and them when it ends up in the ocean. Sometimes they forget to keep plastic and other garbage away from the shoreline” Dora told her son Dennis. 1.Why can’t Dennis play with the plastic bag? 2.What other garbage people put in the ocean or near the ocean could hurt Dennis and his Mother? 3.How does garbage in the ocean hurt people? 4.How can we stop people from letting garbage go into our ocean? You can become an “OCEAN HERO” and receive a certificate to show everyone. After you have completed the tasks, have either your Teacher, Parent, Guide or Scout Leader, email us to tell us you are recommended to become an OCEAN HERO. 4) Participate in a beach, stream, river, lake or ocean shoreline clean up (weigh the bags of waste you picked up and take a photo at the end to show your results) individually or as a group. Wear gloves. 5) Pledge to not litter and to pick up litter near waterways whenever you see it. Wear gloves to pick up litter. 4) Pledge to reduce your emissions “your carbon footprint”, with examples of behavior Example: walking or bike riding instead of driving, getting things done in one trip instead of two. 5) Participate in a beach, stream, river, lake or ocean shoreline clean up (weigh the bags of waste you picked up and take a photo at the end to show your results) individually or as a group. Wear gloves. 6) Pledge to not litter and to pick up litter near waterways whenever you see it. Wear gloves to pick up litter.